Solar pool heaters come in all shapes, sizes, and types, but one basic design has proven to be the most efficient on the market. The basic black polymer panel that comes in 4’x8′, 4’x10′, or 4’x12′ nominal sizes converts a large percentage of the sun’s available energy that hits it into heat for your pool. When most people ask about efficiency they are concerned with the ability of a solar panel to convert solar energy to warm water (as opposed to flow rate, cost, energy use, etc.) Thermal efficiency on it’s own, however, is a poor measure on which to choose a solar pool heater. Efficiency does not take into account cost, features, longevity, warranty, and other important factors in making a purchase decision. In addition, the efficiency numbers published only tell part of the story because ratings are based on test conditions, or optimal conditions that rarely exist in reality. Side note: see our information about solar electric (photovoltaic) panel efficiency here. Different types of solar panel construction affect efficiency under different environments. 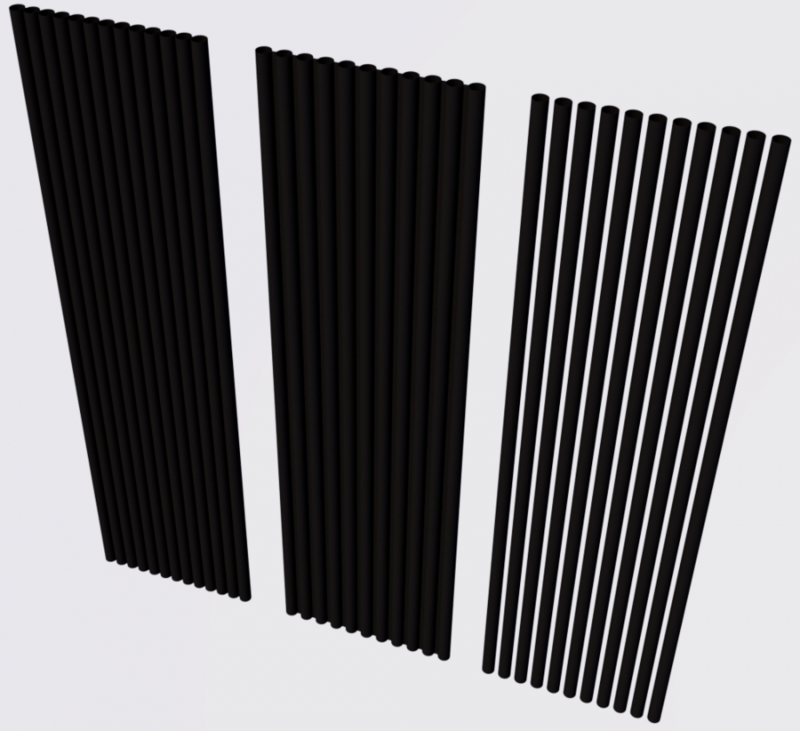 In the grand scheme of things, all of the major manufacturer’s polymer black panel solar pool heating panels fall into a pretty tight range in terms of thermal efficiency. Some are slightly better than others, and some perform better under sub-optimal conditions. The efficiency in any given set of circumstances comes down to materials and design. For example, a separated tube design works great when ambient temperatures are high and wind speed is low. A full body panel works relatively better when the ambient temperature is low and winds are higher. If you look at the type of solar panel and how it is constructed, it’s easy to see why a panel that let’s wind through the tubes might lose heat as air passed through the panel. On the other hand, the same panel can absorb more heat when the outside air is relatively warm and calm. It doesn’t matter if the solar panel is efficient if the rest of the system doesn’t meet the same high quality. For example, many systems use 1-1/2″ plumbing and headers, where virtually all new residential pools are built with 2″ plumbing for more efficient flow. It’s pretty obvious that 2″ plumbing, which has 78% more water per foot, will reduce friction and increase pool water circulation, which is important for heating and sanitizing. Along with 2″ plumbing comes all 2″ valves and fittings. Be aware that some 2″ headers have threaded inserts that reduce the effective cross-sectional area, causing restriction. The quality of the valves, vacuum relief system, and other system components also pay a part in the longevity of the system and the user experience. Automation systems (solar controllers) also make the system more efficient regardless of how efficient the solar panel itself is. The panel itself, which is the major component, is only one part of a system that has to work with your existing pool harmoniously. The system efficiency is what matters. The solar pool heating panel is not the most efficient design or material. The plumbing is a smaller size, reducing flow rate. The valves and other system components are of lower quality and will not last as long. The system lacks an automated controller that will drastically improve system efficiency. The installer is not factory trained and may not meet the workmanship standards you should expect. Solar controllers will automatically turn your solar valve on and off with a small motor. The controller senses the temperature on the roof and in your pool, then compares these temperatures to your desired pool temperature. It turns solar pool heaters on when heat is available and needed, and turns it off if solar heating is not needed or not available due to pool weather. This keeps your solar pool heating system from actually cooling your pool down when conditions on the roof don’t allow heating to take place. Efficiency usually comes at a cost, but ultimately paying a little more will probably result in a better customer experience. A 10-20% higher price often results in a drastic increase in performance when you need it most. More importantly, the ease of use, peace of mind, and longevity of a quality system will easily pay for itself. It can be hard to justify paying hundreds or even a thousand dollars more for a solar pool heater, but rarely do apples to apples comparisons result in big disparities in price. You truly pay for what you get, especially in the competitive Florida solar pool heating market.